The face of the rod shown in your picture looks pretty rough... Got a better picture? Or four, it's plenty long for that! You want to pump that with a bar or four, at 20W each. There's more to it than that though. Much more. There's plenty of other websites out there with information too, not to mention threads on here, on Photonlexicon and on alt.lasers. Also, BUY LASER GLASSES. If you're going to play around with high powered Nd:YAG (be it lamp pumped or diode pumped) you NEED appropriate glasses. At the very least you want OD5+ for 808+1064. Yes, the design of the cavity, the placement of the pump diodes, the optics, temperature management and so much more is needed to make this a success. Sam's Laser FAQs is a great place to start. Another good reference is Walter Koechner's book, "Solid State Laser Engineering". Got a hardcover copy myself. 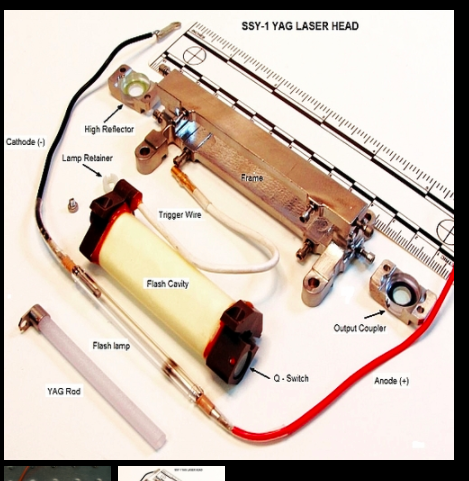 Alright I’ll probably have to wait on that then and maybe just make a handheld YAG laser. If I can get the optics aligned that is. Thanks guys! Also I just got my ND:YVO4 + KTP crystal ordered, it’s pretty large 5x5x3, so not to tiny like the old crystals that everyone used I forget the name something that starts with a D. Also a 6x6x5 KTP crystal that is huge. Should be fun and the first crystal stated is optically bonded, not glued. What are the units for your crystals? Inches, millimeters? You say large and then post numbers, but without units, they are meaningless. I suspected it was mm. But, until you state it, one cannot know. If you want a project, you have one with that rod like that. I've seen people get rods working by simply wrapping aluminium foil around a rod and flash lamp together, but surely much less than optimal. Research elliptical cavities for rods, it's not a project I would want to take on, or driving them with bars for that matter. For myself, I would find a YAG already mounted in a cavity with flashlamp and mirrors already in place, that's enough work like that for me. Alright thanks Alaskan! I actually have a deal with a guy in Scotland named Caspar Clark he is the CEO of Helia photonics and he said he would coat the ends of my ruby rod from the m60 tank and the small YAG crystal for free if I paid shipping here and back (about 100 dollars give it take) so I think after that I might get a single 30-40 watt diode bar and line it up with the rod and see what happens. Also did you get my PM? hi, yea, i got your pm, i thought mirrored coatings on a rod like that would be big bucks to get done and you got it FREE! yes, i received your pm, what i was trying to tell you is the ssy-1 i got from you has the Q-switch already in it, that is why i'm perplexed why you said it was taken out and included an extra one in the package. Might want to check again Alaskan...I’ve only owned 1 SSY in my life so it can’t have 2 q-switches. Unless the laser fairy put one in there for you but really though I put the one in the little foam package and there isn’t one already in the housing. Also I am very grateful there are people like that in this world. Originally the quote was 2000 USD to get one rod coated, but I told him I am a hobbyist and would love not using external mirrors. He was very nice about it and said he could help. So shortly I’ll be shipping them off to Scotland for coatings. Very awesome person!! And also just check once more for me Alaskan about q switch. ok, i don't know what the hell then, here's a photo showing one of these taken apart, with an arrow pointing towards the q-switch, that is there on the one i'm looking at. only explanation for this is i have looked at the wrong SSY-1, i have several, i will figure this out but i don't know how i could have gotten this wrong with keeping the one with the extra switch in a zip lock bag separate.